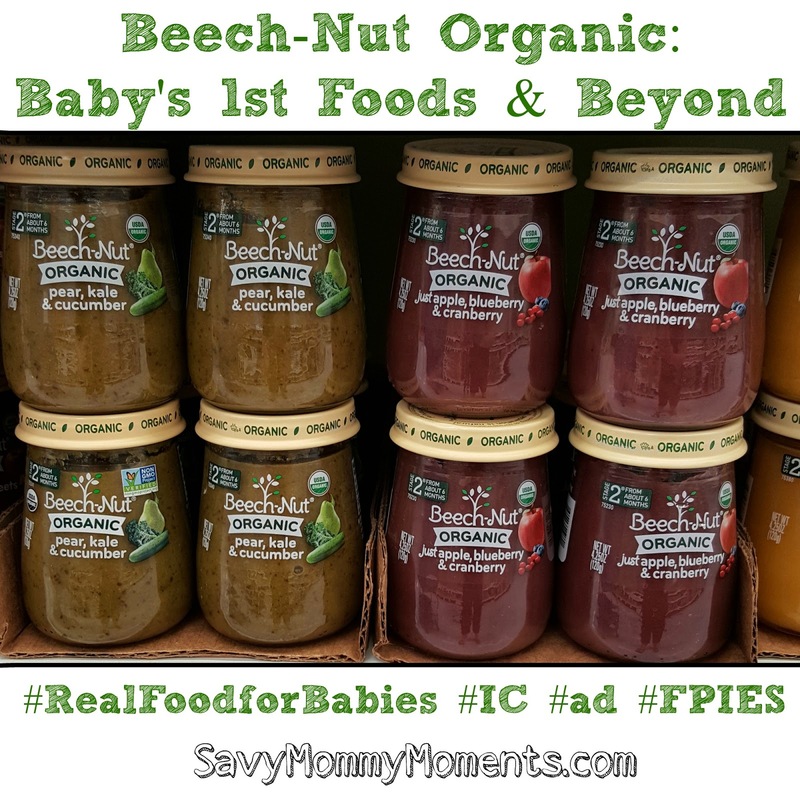 As you know, our youngest has FPIES and when she was starting solids, it was a real struggle to find an affordable pure baby food on the shelves for her. Yes, I do believe in making baby food for your little ones, but I also like to find a baby food brand that I can rely on to supplement the food I make at home. 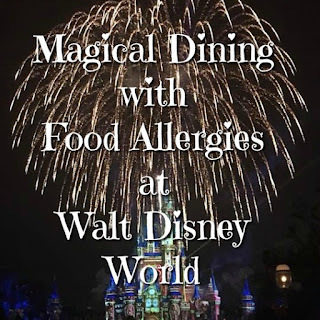 Also for her FPIES, we have to trial each food separately and it was so much affordable and efficient to buy a small jar of just that food off the shelves rather than buy and make it at home. Beech-Nut was the ONLY widely available and affordable brand that I found where the ingredients were just what it said on the front, no fillers or additives. So, I'm really excited that they have boosted this up a notch by making an organic line of their baby food! 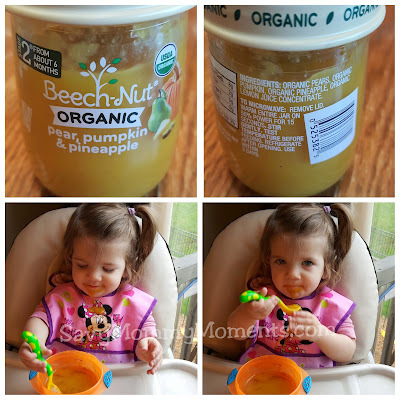 Not only does Beech-Nut have pure ingredients, but they also use a process very similar to the process moms, like me, use at home to make baby food. They don't add in any extra water or artificial additives to make sure all those very important nutrients stay right where they belong, in the food. Also, just like their naturals line, their organic baby-food line comes packages in clear glass jars. The organic line is also USDA certified which assures you that the food inside is free of GMOs. I visited our local Babies "R" Us store to checkout the selection of Beech-Nut organics. There was a really great assortment of "just" and combination foods, including organic apple, raspberry & avocado, organic banana, cinnamon & granola and organic butternut squash, black bean & cumin. Also, they were on sales for a great price! They also had two type of variety packs available for purchase that were filled with fun combinations and packages nicely for gift-giving. We decided to try out the Pear, Pumpkin and Pineapple organic food. This is a perfect combination for Savy Baby as she is FPIES to many foods and these are three of her safe favorites! Now, you may be thinking that baby food is only for little babies, but that's just not the case at all. Savy Baby recently turned 18 months old and loves to feed herself. Sometimes, we like to give her a jar of baby food, like this one, instead of applesauce in a bowl and let her practice using her spoon to eat it. It's a fun way for her to learn to use a spoon as well as a delicious combination that's better than boring old applesauce! She really loved the taste and smooth texture of it and even asked for more. 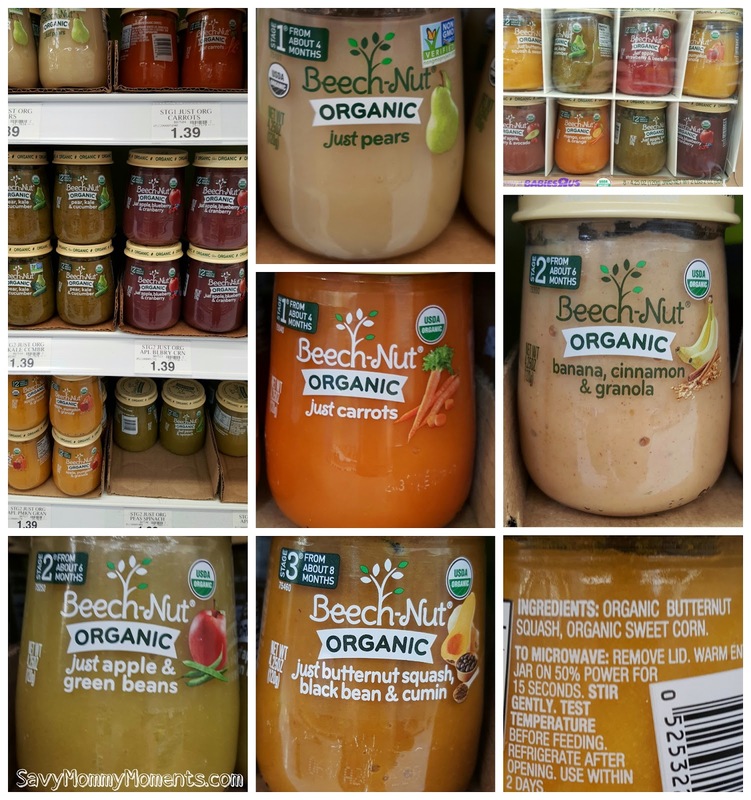 Other ways that we also use the Beech-Nut organic baby food is baking it into recipes for added nutrients in place of oils/fats and freezing it in popsicle molds for a fun frozen treat! 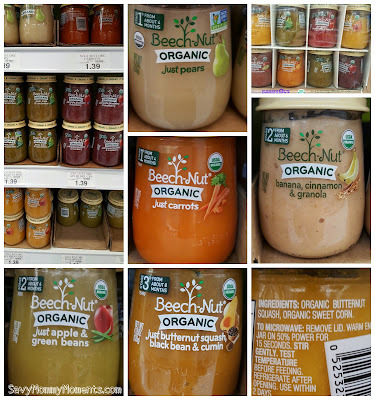 I highly recommend if you have a little one on the way or in your life, you check out the new Beech-Nut organic baby food line. If you still aren't convinced, you should be by knowing that Beech-Nut was awarded Product of the Year in the baby category for its 100% naturals and organic lines, as selected by more than 40,000 consumers in a national; representative survey by Taylor Nelson Sofres. Get out there and buy some today! 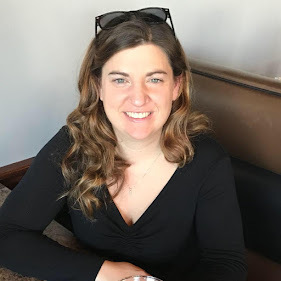 It is widely available at retailers across the country including Kroger, Babies “R” Us, Wegmans, Price Chopper, Wakefern, Walmart.com, Winn-Dixie, BI-LO, Stop & Shop, Giant Carlisle, A&P, Pathmark, Albertsons, Hannaford, Raley’s, Meijer, Nugget Market, Diapers.com, Harris Teeter, Shaw's, ACME, Shoppers Food and Cub Foods. Click here to locate a store nearest to you! GIVEAWAY! Visit the Beech-Nut site and leave a comment (be sure to leave a valid e-mail address) below telling me which organic food combination excites you! You will win a coupon for a free Beech-Nut product! Giveaway ends 5/22/2015 at 3 pm CST. Contest entrants are only eligible to win once per sweepstakes, per household as part of a campaign sponsored by Influence Central and must reside in the United States. Follow Beech-Nut on Social Media!